The Farmhouse Obsession: Worth the Wait? I've always heard the expression, "If it's good, it's worth the wait." Well, that can apply to a lot of things. It certainly can apply to brewing with specific styles of beer. Some beers are fantastic when, grain to glass, they take a week or even less. Pale ales, IPAs, and even some Berliner Weisse beers I've tasted were well done and took only seven days to brew then drink. While there are many styles that have this quick turnaround, there is something said about a brew that has had time to develop either in the bottle or from a long fermentation. I, by my own nature, am not a patient person. If I know I'm waiting on something I can become frustrated or even frantically wanting time to pass by faster. This is not something I'm proud of, mind you. I've always associated it with my, never diagnosed, borderline OCD. This is also a benefit in that, when I get into something, I TOTALLY get into it. It's helped me learn tons about brewing and many other topics. I will pour through a book in a matter of days and sometimes hours. I'm constantly reading blogs (many of which are listed to the right), flipping through magazines, browsing forums, and looking through the internet for information regarding the process or history of different types of beer. Most of this has been regarding Saison and Sour beer information. Some of it is based on my other hobbies, comics and the Magic the Gathering card game. For the most part, though, my obsession for a long time has been beer brewing. Knowing all of this, you can see how it can be a struggle for me to brew anything that would take a while to see the profits from it. I have developed a system to help me combat this. Reading a few different blogs, I learned to brew different types of beer that I can keep on hand for blending. I also brew beers that will take less time to finish so that I have something to do in between my long fermentation time batches. In doing this, I'm still learning about the craft but I'm also pacing out batches that will stagger in their completion. This keeps a steady supply of beer and keeps my mind constantly working. Some of the entries on this blog will be those long wait beers and some will be the ones I finish in a few weeks. I'll also try to do some write ups about my blending of both older beers as well as blending fresh beers. Today's post is a beer that took just under a year to get where I wanted it. 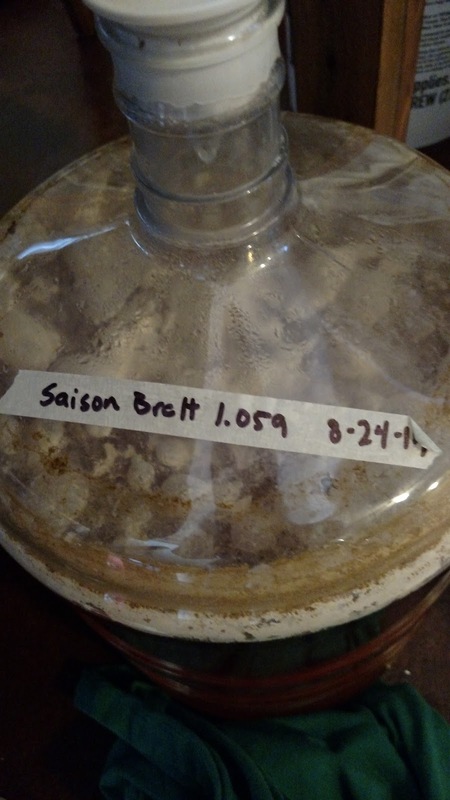 On August 24, 2014 I decided to brew a Saison with Brettanomyces Brux. I knew I wanted to make a beer that I could age for a little while and really get some of the bretta notes out of it. Below is the recipe I decided on. Notes: Added Dregs of Jolly Pumpkin Bam Biere when pitching other yeasts. At the time I brewed this, I was using Wyeast 3711 a good bit. It was working well for me and I wanted to try it with co-pitching a Brettanomyces strain. 3711 is so aggressive and attenuates so well on its own, I had no idea if it would leave much in the form of simple sugars for the bretta to chew on. Brettanomyces is such an interesting little organism though. It is capable of fermenting longer chains of sugars that the Saccharomyces may not be able to handle. It is also able to metabolize other esters, particles and even dead Sacc cells. I wanted to test that out with the brew. During the brewing process I was drinking a Jolly Pumpkin Bam Biere, which is a fantastic Farmhouse Saison. I decided I would add the dregs of this bottle as well to get a more complexity and maybe a bit of tartness to the brew. A few weeks before the brew day, I mad a small 500ml starter of 1.040 wort with some DME to pitch the vial of White Labs WLP650 Brettanomyces Bruxellensis. I wanted to create a larger population of bretta cells to pitch with the Smack Pack of 3711 French Saison yeast. After the starter had spun a few days I removed it to sit the remaining 5 days at room temperature. I was trying my best to keep the bretta from producing any acetic acid that would introduce harsh flavors to the beer. I stepped up the starter one more time with a 1000ml of 1.040 wort made from DME. I put the flask into the fridge so I would be able to decant the starter beer off before pitching. Brew day I ground the grains and pulled the starter of bretta and the fresh Smack Pack out of the fridge and ruptured the starter in the Smack Pack. Within an hour the pack had swelled perfectly. I have been mashing most of my Saisons around 150-151F to leave a bit of complex chains of sugar for the bretta to eat. Even doing this, most all of my beers are fermenting to 1.002 or 1.004. Some, like this one, have even ended up fermenting completely dry at 1.000. A 75 min mash followed by a sparge with 168F water gave me a boil volume of just under eight gallons and a pre-boil gravity of 1.045. I boiled the wort for 90 minutes adding my hops at 90 and 20 minutes. With 15 minutes left to go, I added one cap of yeast nutrient and placed my wort chiller in the kettle. Cooling wort, in Mississippi during August, is quite the challenge. My ground water was well into the mid 80s F by this time. Even with using a pre-chiller and ice I was only able to get it down to 78F in a reasonable amount of time. There I transferred just over five gallons of the wort to my six gallon Better Bottle. The starting gravity was 1.059. Just a little higher than I had intended. I pitched the decanted starter of bretta and the swollen Smack Pack of 3711. When I had poured all but about half an inch of the Bam Bier into my glass, I emptied the rest of the bottle into the carboy. My fermenter was set to 68F and it rested there for three days. I let the fermenter rise to 74F on it's own for two weeks and checked the gravity on 9-13-14. By that time the beer had reached 1.008. 9-27-14: The gravity had fallen to 1.004! Maybe a touch less around 1.003 or so. The fermenter smelled amazing and you could definitely pick out the additions the Jolly Pumpkin dregs had made. I removed the carboy and placed it in the corner of my dining room covered to rest until I thought it was ready to bottle. I didn't touch it for about six months. I like to leave my beers in primary for the most part. Some folks will rack to secondary for extended aging. 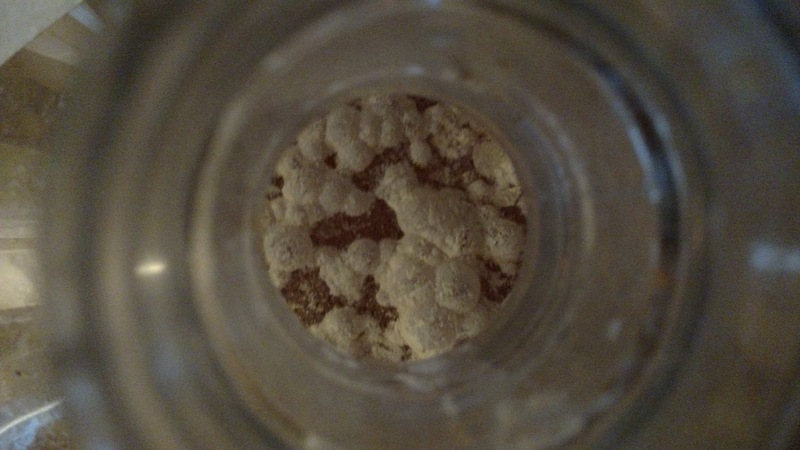 3-21-15: The beer had a fantastic pellicle on the top. I didn't disturb anything then. I knew I would want to check the pH soon and do a flavor and aroma test. 5-27-15: I took a sample to check the flavor/aroma and pH. 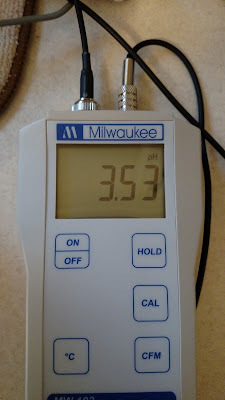 I didn't have my pH meter at the time of brewing this beer so I'm not sure what it was then. At the time of this sample the beer had reached a pH of 3.53. The flavors were really nice. Tart, funky, notes of spice and a bit of hay and citrus notes. Jolly Pumpkin dregs are amazing that they can take a beer with almost 30 IBUs and drop the pH that far! The gravity was 1.002. 6-10-15: Bottled the beer with 5.5oz of dextrose (corn sugar). 7-12-15: Poured a bottle and while there is a decent amount of carbonation, no head lingers. Still looking for a bit more carbonation. Flavors are fantastic. Super funky, tart and still the Saison spice and fruitiness shines through. Can't wait to get good tasting notes from a fully carbonated bottle.